Use the rule of three. 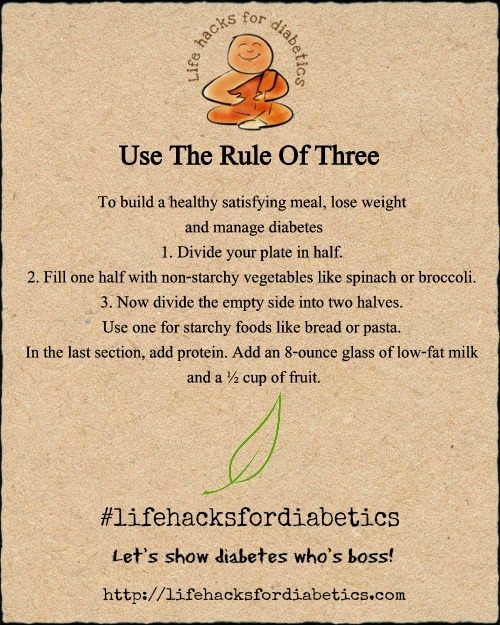 To build a healthy, satisfying meal, lose weight and manage your diabetes 1. Divide your plate in half. 2. Fill one half with non-starchy vegetables like spinach or broccoli. 3. Now divide the empty side into two halves. Use one for starchy foods like bread or pasta. In the last section, add protein. Add an 8-ounce glass of low-fat milk and a ½ cup of fruit.